Carlos Slim, flanked by Carter Roberts and Omar Vidal, both of the World Wildlife Fund, was enchanted by the monarch butterflies his money now helps to protect. When Julia Carabias Lillo, Mexico’s former environment minister, first approached Carlos Slim Helú in the late 1990s to enlist his help protecting the country’s environment, the billionaire businessman seemed unconvinced of the strategies she proposed. But a dozen years later, Mr. Slim is the biggest backer of the World Wildlife Fund’s Mexico affiliate, on whose board Ms. Carabias serves. In 2009, his Carlos Slim Foundation pledged $50-million for an ambitious plan to conserve six regions of Mexico, an effort that World Wildlife employees say he is actively involved in helping to shape and carry out. “He got trapped by nature,” says Ms. Carabias. A longtime supporter of health and education causes through his telecommunications company’s Telmex Foundation, Mr. Slim seemed less interested in environmental protection when Ms. Carabias first approached him, she says. But after a few U.S. foundations became involved in preserving one of Mexico’s environmental gems, a monarch-butterfly sanctuary under threat from illegal logging, Telmex contributed some trucks to help a government environmental investigative agency monitor the forests. Then Omar Vidal, who leads the World Wildlife Fund’s Mexico office, began to talk with Héctor Slim Seade, Mr. Slim’s nephew and an executive at Telmex, about other ways to help. The conversations resulted in a pledge of $500,000 from the Telmex Foundation for the nonprofit’s work in the butterfly reserve. 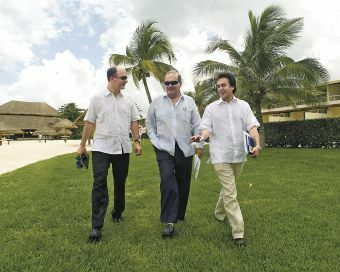 Other trips for Carlos Slim followed, some accompanied by Carter Roberts, World Wildlife’s president. Mr. Roberts recalls standing by Mr. Slim when a blue whale surfaced alongside their boat in the Gulf of California. Later, Mr. Slim suggested the charity feature that species of whale on its promotional materials. By 2009, after long conversations with Mexico’s government and local environmental leaders, the World Wildlife Fund came up with a plan for a seven-year effort involving local communities, nonprofits small and large, and the government that could turn the country into a model for conservation. Mr. Slim agreed to give $50-million—on the condition that the nonprofits raise another $50-million in matching money. Three years into the project, Mr. Vidal says he has talked with Mr. Slim perhaps 35 times about its progress. Mr. Slim is a results-oriented donor who is fond of describing how philanthropy doesn’t always achieve its objectives. Sitting in his sun-filled Mexico City office, Mr. Vidal flips through a thick white binder to show the charts he shares with Mr. Slim during their meetings. Mr. Vidal says that Mr. Slim, with his business mind, has encouraged the World Wildlife Fund to consider more closely the economic dimensions of its work. He nudged the organization to move faster in helping indigenous people near the butterfly haven give up logging in favor of work in tree nurseries, ecotourism, and other ways to earn a living. Today, Mr. Vidal says, the rate of logging has dropped to less than 1 hectare per year compared with 460 in 2006. But Mr. Slim’s hands-on style doesn’t always make him easy to work with. Raising $50-million in matching money is proving difficult: So far, the World Wildlife and the local environmental groups it works with have raised about $13-million. Mr. Slim also has strong opinions, and his focus on short-term, measurable results sometimes clashes with the realities of environmental protection, say World Wildlife employees. “He likes for things to happen quickly, and conservation does not happen quickly,” says Mr. Vidal. But World Wildlife staff say Mr. Slim can be convinced to change his views. He initially stipulated that the $50-million go entirely to conservation work, not to helping the nonprofits cover their administrative costs. But that requirement placed many of the 37 local environmental groups in a financial bind. After a discussion, Mr. Slim agreed to allow the nonprofits to spend 8 percent of the money on administration. “He understood that very clearly,” says Ms. Carabias.